Pooris are nice when they are puffed up. Although you will eat it by tearing a piece titally deflating it, a poori is a poori only when it is puffed up like a balloon. It is a joy to watch the poori puff up while frying it. It feels like you are creating a magic. I know I am exaggerating but thats how it feels. Poori dough is just like chapatti dough except that chapatti is roasted on a tawa and poori is smaller and is deep fried. I used to knead the dough with water till my husband told me to knead with milk to yield soft pooris and I started kneading chapatti dough also with milk. You most certainly will noice a difference in the texture. You may think who doesn't know to prepare chapatti and poori and why a post for simple recipes.. well, I am posting almost everything that I prepare in my kitchen and this blog will be a gift from me to my daughter when she grows up so I want to include everything. 2. Add warm milk little by little to form a dough. You can use water if you do not want to use milk but milk makes pooris softer. 8. Heat oil for deep frying and reduce heat to medium. 9. Carefully drop one of the rolled disc by slipping it into the oil. 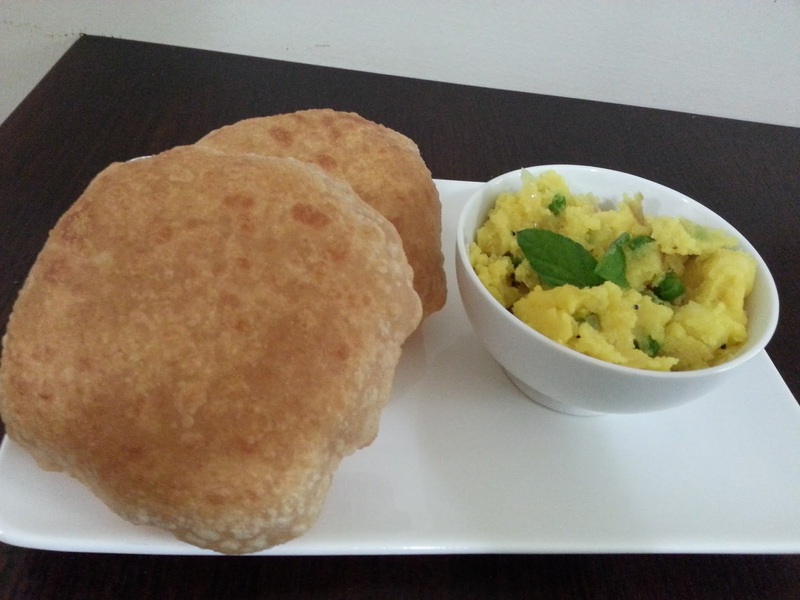 With the spatula lightly press on the surface of the disc as this will make the poori puff up. 10. Turn the poori and let it cook on the other side. 11. Keep turning and let it cook and turn golden on both sides. 12. Remove to a plate laid with paper towel by draining all the oil.